So you’re planning to join us in on the trip down to bahia de los angeles. I have complied a few notes that may be helpful for getting ready to head South with us. For you veterans of baja, please feel free to tell me what I’ve forgotten. Just email with your comments to Ken Decroo, decrkl@charter.net. I’m sure I’ve forgotten lots of things as I complied this so come back often as this is a living document that will be updated frequently, especially when Tammy has had a chance to review this! This is page is mainly geared to those who haven’t made this trip before. Our trips are low key and not that planned. The itinerary is just a rough sketch based on our past travels but certainly open to change. People just do what they enjoy. Some stay pretty busy all day and others work on their tans as they sip something refreshing. The most important thing to remember is that you’re in a foreign country so act accordingly. You must have all your paperwork in order and if you wish to get back into to the USA, you must have a passport or passport card to show US Customs. Make sure you have Mexican Vehicle Insurance and a Tourist Card. I’ve listed below where to get them. Mexico doesn’t recognize any insurance but policies that have been issued by a Mexican company, period. A Tourist Card is not important until you have a problem and are asked to produce it by an authority. What I mean is, you will not need to show one unless you have some sort of accident or are witness to one. The card is proof that you are in the country legally. 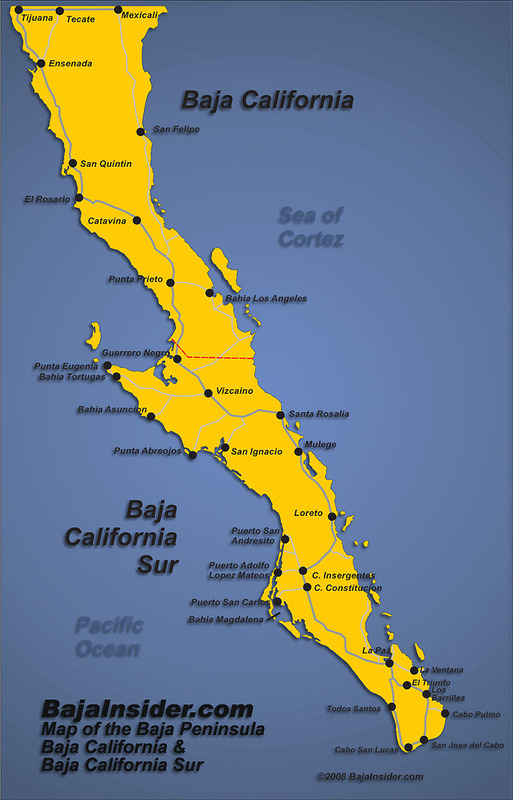 In Bahia de Los Angeles you may be ask for a fishing license if you are diving or fishing. If you can’t produce one, you have problems. That said, in my experience if you have your paperwork in order, you will not have any problems. If you join Vagabundos del Mar, they will help you with most of the paperwork before you leave. Also, they will give the most recent updates of road conditions, etc. For us who are motorcycling down ADV rider discussion forum is the best place to go. Adventuer Rider – Ride the World! I want to make sure you understand that we will be camping on the ground! We have a 36 foot support trailer with a covered deck built on to it but we are camping or as some call it, “roughing it.” Everyone chips in with the cooking and keeping camp clean. We stay in tents but usually prepare our meals communally. There is a kitchen, bathroom and shower in the trailer and we have a tented area with toilet and shower outside as well. Much of our cooking is done on the BBQ. We eat a lot of fish on these trips. If roughing it gets to be too much, your choices are to head North early or stay in one of the motels in town. You are responsible for own personal area having your own tent and sleeping bag/blanket, pillow, cot, folding chair, private creature comforts,etc.. So plan accordingly! If you are unsure email me or Tammy, decrtl@charter.net . Make sure your vehicle is in good repair and ready to travel on rough roads with some graded dirt. If you don’t want to get your car dirty or worse, this may not be the trip for you. We usually meet on our own at our place in Estero but travel South in a caravan. We leave early (5am) on the day we head South which puts us in Bahia de Los Angeles in the early afternoon if we don’t have any complications like car trouble, etc. The road is narrow and lacks much of a shoulder. Expect to average about 50 mph on the way down. It is not wise to speed on these roads. We will clear 2 to 3 military checks on the way. This can be a little unsettling to the newbie. The military is armed and prepared for possible drug and gun smugglers but we are not their concern. They may wish to search your vehicle or belongings which is routine. I personally welcome their presence. Cooperate and be polite. These soldiers are working in the heat of the desert and far from home. I often give them a soda or snack if I have one and thank them for their service. You will be meeting Tammy and I at our place in Estero Beach, #358. For those of you who don’t have a place in Estero, your options are as follows: throw your sleeping bag down somewhere at one of our places in Estero, stay in a tent in the RV park which is very nice with one of the best views of the ocean in the complex or stay in the hotel. They have great rooms and cottages. You can visit the Estero Beach Hotel and Resort web site for more information. We will have a great adventure and make memories for a lifetime. Every trip to Baja is a different experience and I never tire of the natural wonder of the this wild place and rich culture of the people. See you all soon! Click Here to Enlarge Map! Here is a link to important information about the passport and Mexican Tourist Card requirements for entering and leaving Baja! Click here. Tourist Card (Vagabundos de Mar, Some AAA, or at the border) No matter where you get one, you need to have it validated at the border. Pesos/Dollars (There are lots of booths to change your dollars to pesos (Cambios) in Ensenada. Their exchange rates are posted. When shopping around for a good rate make sure there is not a “commission” added to the transaction. Our favorite exchange booth is on the ocean drive just as you are leaving the beach front in Ensenada. Ask Tammy for directions!). Tammy and Stephen swear the the Lucas gas additive really helps the vehicles run better when using Mexican gas. While we’re talking about gas–make sure you watch the attendant put the gas in your vehicle particularly that the attendant zeros out the pump first! A Spanish grammar/vocabulary book can really be helpful. Stop at all military check points. They are there for our safety. Be polite. Watch for speed bumps (topos) as you enter towns and sometimes near schools, parks, etc.. If you don’t come to an almost rolling stop, they can literally launch you into another dimension. Never drive at night in the frontier. Make sure you vehicle is in good running condition with plenty of rubber on your tires. It needs to dependable and able to negotiate the Baja heat and lousy tarmac and dirt roads. Spare Tire (properly inflated), Jack and Tire Iron that fit your vehicle! If you are towing a trailer, make sure you have checked and greased the wheel bearings! Beach cruisers are fine for Estero but not for Bahia (You can store them at our place in estero until you get back…Oh, beach cruisers are great in Estero). Most of the time we share gear (I.E. There will several kayaks around with paddles) Stephen Parks will be with us and he is a world class kayaker and is always happy to get you started out right. Motos usually enter Mexico at Tecate. All others enter Mexico at Tijuana or Otay. Gas up and get and/or validate Tourist Cards, secure insurance if you haven’t done so already and change money either at the border or in Ensenada. Arrive at Playa de Estero 6 miles South of the coastal town of Ensenada. Accommodations are as follows: Sleeping bagging it at Ken’s place, tenting in the RV park or staying at the hotel playa de estero. Side trips – Natural hot springs, La Bufadora, kayaking, fishing, shopping in town, hanging out at the pool, or just sipping a cool one and working on your tan, .etc. Breakfast, lunch and Dinner on the deck at Ken’s place each day or in the village (on your own). March 30 – Head North from Estero to Cross the border at Tijuana or Tecate – Day 11 – Adios y buena suerte! Pingback: Upcoming Adventure to Bahia de Los Angeles, Baja Norte, Mx | Baja Moto Quest! Pingback: First Adventure of Spring 2015 to Bahia de Los Angeles, March 21 -29! | Baja Moto Quest!